After New Years Eve my family and I went on a little vacation. We took a road trip visiting many small towns and big cities in Texas. Things got exciting when we stopped in a nearly deserted small town, which will remain undisclosed, and found a group of antique stores. We went into two that had freshly made crafts and one that was nearly empty save for a few nice antique items, but not a corkscrew to be seen. Since we were running low on time we asked one of the shop owners where we could find some antique corkscrews and she pointed us in the direction of the antique mall. We entered this large antique mall and started looking through cases full of small items all while discussing how we never find any good corkscrews in antique stores anymore. 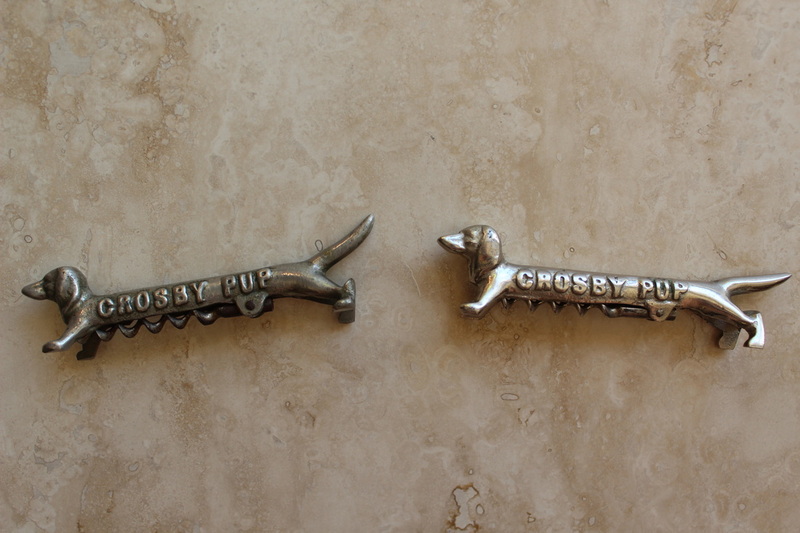 As I was looking through many little trinkets in one of the cases, my eye caught the sight of a small silver dog with a long body and quickly realized that it was an infamous Crosby Pup corkscrew. It is believed that Bing Crosby produced around 60 of these corkscrews to give to his closest friends, which sell historically have sold for an average of $1,000. The one I found had a price tag of $15 and it was in a case with 15% off, making this find the best deal we have ever found at an antique store. As you can see, our Crosby Pup is in perfect condition. We plan to keep this one in our collection. I am regularly contacted by people who have corkscrews to sell. 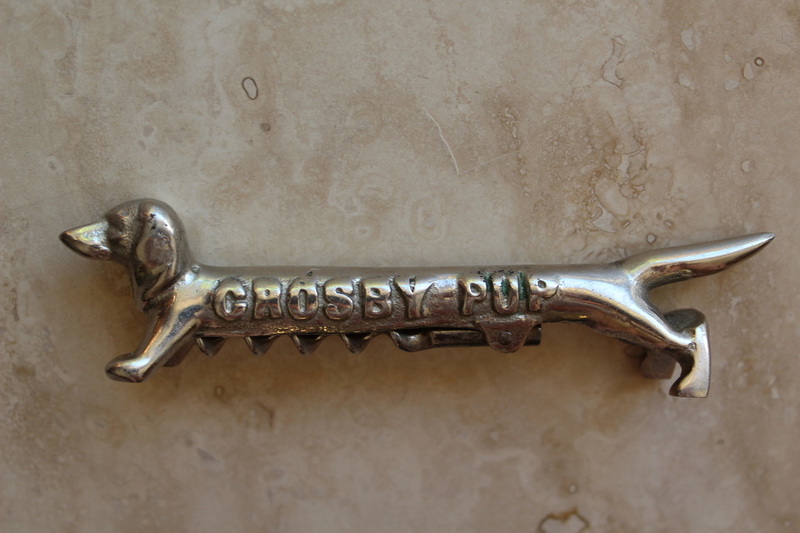 As luck would have it, I was contacted by someone who wished to sell a Crosby pup corkscrew. I already had one at the time, but knowing the rarity of the item I jumped at the opportunity to acquire another one of the rare gifts that Bing Crosby gave to his friends. So we quickly came to an expensive, but fair price.